Customer retention and reputation protection are two of the biggest priorities for design-builders today. 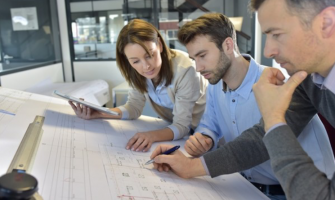 To achieve both, you’ll need to ensure you have the right people on your design-build team. One of the most important parts of that is determining who should be responsible for designing and installing the industrial concrete floor. After all, the floor is the most-used part of the facility. A concrete floor contractor that is experienced in designing highly durable floors for high-traffic facilities will be more cost effective in the long run than a traditional concrete floor contractor. 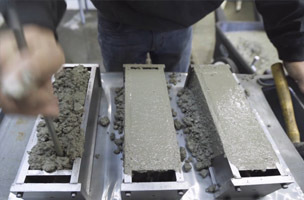 This is because they not only bring unique advantages to the table for your design-build team, but they can help you consider every aspect of planning the industrial concrete floor. We’re talking about a turnkey operation — a contractor that designs the floor system, installs it with their people and warranties the floor system. 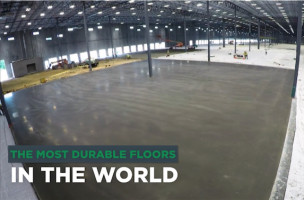 What Goes Into Planning an Industrial Concrete Floor? Owner’s expectations: First and foremost, you should consider the facility owner’s expectations for the performance of the slab and aesthetics of the slab. Which type of floor system is best for their specific facility type? What do they want the floor to look like? What will they be using the facility for in the next 5-10 years? You have to get clear expectations in order to meet or exceed them. Type of forklifts, pallet rider trucks and other equipment: The type of equipment moving across the floor will have an impact on the floor’s design. Will the facility be using standup forklifts? Narrow-aisle lift trucks? Rider pallet jacks? Quads? Automated storage and retrieval systems (ASRS) are becoming much more popular, which opens up a whole new list of factors for the floor. Considering the type and weight of this equipment is important. Frequency of traffic: There’s a big difference between the needs of a floor with low-to-medium forklift traffic and a floor with high traffic. If the facility has 24/7 operations, it will require a more durable floor (with greater abrasion resistance) than a facility with traditional daytime hours. Lifecycle cost: How much is it going to cost to maintain the floor during its lifetime? You want to ensure the floor will meet the needs of the facility owner and that it won’t result in an enormous amount of wear and tear or unexpected repairs and expenses. What will it cost over the life of the floor to maintain the joints? Equipment wheels: The type and hardness of equipment wheels can have a big impact on floor deterioration. 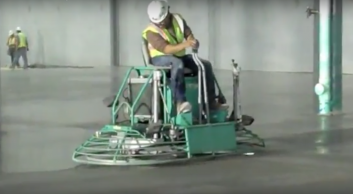 Wheels have become harder and harder in recent years, so floor designers need to keep this in mind when planning an industrial concrete floor. Rack loads: Just like you would think about the weight of equipment, you have to think about the weight of the product inventory racks, as well as the weight of the products that will be stored on the racks. The type of racks the owner prefers to use is another consideration. Quality of subgrade: Finally, the material upon which the concrete is placed needs to be considered when planning the industrial concrete floor. You may only be considering the short-term performance of subgrade, but an experience concrete floor contractor will ensure it has a proper foundation for the life of the floor. 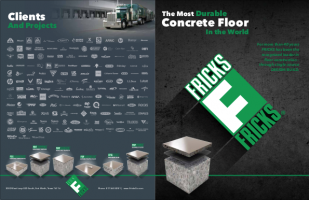 Not only will the right industrial concrete floor contractor consider all of the above factors of planning the floor, they’ll bring several unique advantages to your team. For starters, you’ll have the advantage of the floor contractor taking total responsibility for the floor. 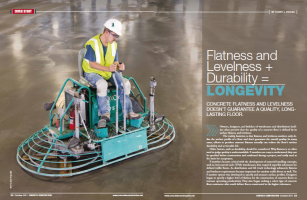 Since the most important standard in a concrete floor is durability, the contractor will have a personal investment in planning and placing a floor that performs better, has a long life, is able to withstand harsh abuse and pays dividends for years to come. By using an experienced industrial concrete floor contractor that provides a total package from design to responsibility, you can also have peace of mind about what to expect when it comes to warranties. Overall, it’s a win-win for your design-build team. As a design-builder, it can be difficult for you to consider everything when planning an industrial concrete floor. By hiring the right industrial concrete floor contractor for your team, you’ll deliver a high-quality, long-lasting floor and be well on your way to customer retention and reputation protection.